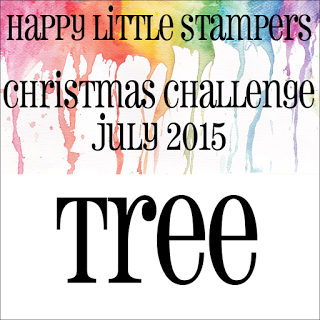 It's the middle of summer and I have another Christmas card to share! I bought this Stamping Bella stamp, Mr. Penguin goes for a ride, over a year ago because I thought it was SO cute! Which it is - but I keep forgetting that I really don't like to color very much (!) so this is the first time I've inked it up. I colored the image with Copics. I thought a little girl like this would have a sweet little pink winter coat with accents of purple - so my color pallet was decided! I die cut the image with a Stitched Edges Rectangle die from Waltzingmouse and layered it over a piece of patterned paper with foam dots. The sentiment is from Nutcracker Sweets from WMS. The tree has little round ornaments on the stamp but I decided to glue flower sequins over them. Since this card is hot off the press - you can still see the glue in the centers - when it dries that will be clear! They add a lovely shine to the card as well as a little dimension! 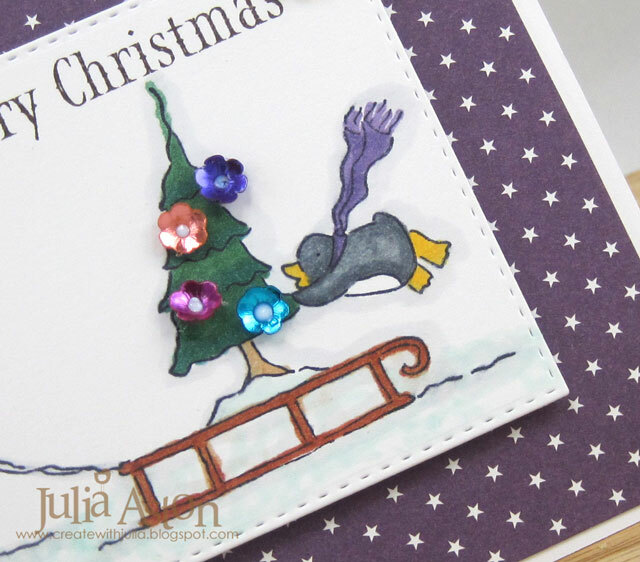 Stamps: Mister Penguin Goes for a Ride - Stamping Bella, Merry Christmas from Nutcracker Sweets - Waltzingmouse. Accessories: Stitched Edges Rectangle dies - Waltzingmouse, Copics, Flower Sequins - Cartwrights, Scotch Quick Dry Adhesive, foam dots. Hi Julia, Of course every little girl loves pink & purple (getting ready for when she's an older red & purple Hat lady!) This image is just so cute and love the tiny tree on her sled, and grinned at the little penguin pushing from behind. Cute sequins trimming that tiny tree too. 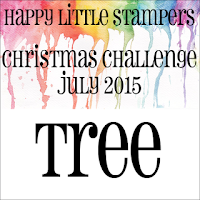 Thanks for joining in on the 1st HLS Christmas Challenge. Hope to see you next month too. Hugs. You've colored this beautifully, Julia! No need to not use this stamp! Love the sweet colors you chose for the little girls coat and scarf and I have to smile at that penguin holding on for dear life! What a darling image! Thanks so much for sharing it with us at Merry Monday! Oh, Julia, I wasn't paying attention to the challenges I was so taken with your card! 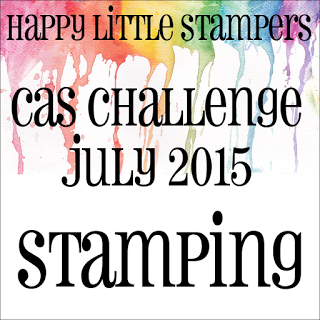 Thanks for sharing with us at Happy Little Stampers too! 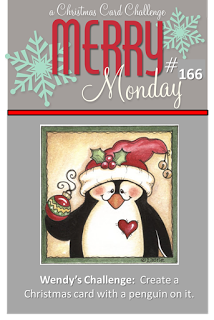 That flying penguin really made me smile - thanks for playing along at Merry Monday!! Super sweet card Julia! What a darling image! Soooo cute...love how that little penguin is hanging on for dear life. Very sweet card. 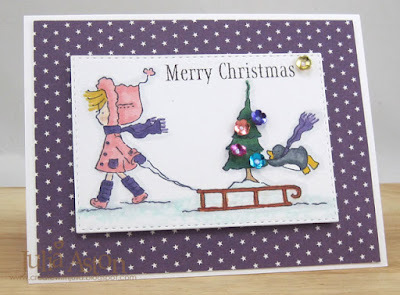 This image is adorable - I love that wee penguin hanging on for dear life behind the tree! Fabulous card! Thanks so much for joining us at Merry Monday. Oh, this card is so sweet. Love that sweet image and the colour palette! 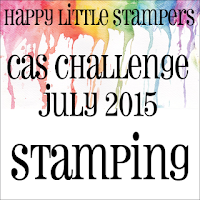 Thank you for playing with us at Happy Little Stampers!